We received so many wonderful cards and gifts from around the world that I really wanted to send a special thank you in return. My brother (who is an amateur photographer) came over one afternoon when Sebastian was a few weeks old and we sat in our bay window with the sun beaming in on us while Ollie shot some amazing photos. We quickly uploaded them and I just fell in love with this photo. We sent it over to Scott and a few minutes later, the Mac whizkid had designed this amazing birth announcement card. After a bit of research online, I found Instant Print and placed an order for 100 matt laminated A6 cards. They arrived a few days later and they were just perfect. I spent all of that evening writing personal messages of thanks on the back and raced to the post office the next day to send them off. 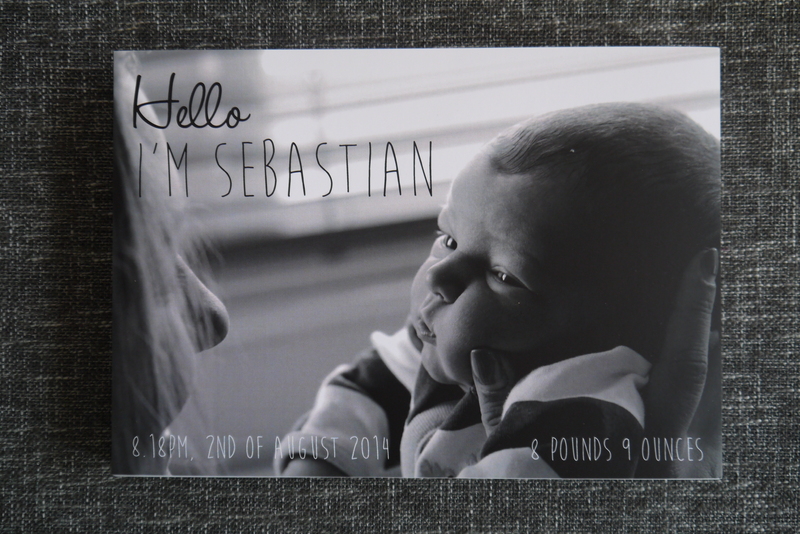 Birth Announcements are a wonderful way to say thanks and I would highly recommend getting some printed to your little bundle of joy!